Please note: We only supply the tyre. Even if a rim is shown in the photo, it is not included in the price. Michelin - Reifenproduzent aus Frankreich. 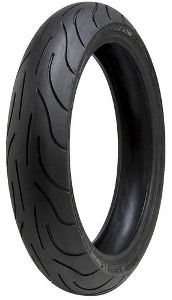 A dual compound Sport tyre designed for sporty riding. With excellent grip in the wet and dry, its a versatile, durable tyre. MICHELIN Pilot Power 2CT tyres are designed to help you get maximum pleasure from sporty riding. Meeting the high standards of riders by combining excellent grip on dry and wet surfaces in addition to long lasting quality. These tyres are durable in the centre and softer at the edges to allow you to achieve impressive lean angles more usually seen on the track. MICHELIN Pilot Power 2CT tyres have MICHELIN dual compound 2CT technology to thank for their outstanding performance. Designed to last on long journeys without ever coming unstuck, MICHELIN Pilot Power 2CT tyres can withstand the impact of accelerations and the bite of the brakes without flinching. Michelin – we take you further. The vision of our founders, Edouard and André Michelin, has guided the development of the MICHELIN brand for more than 125 years: making driving as simple, safe, and comfortable as possible – first with innovative tires and wheels, followed by road maps, travel guides, and contributions toward improving traffic infrastructure. Along with this comes a strong engagement with the environment, as modern mobility must be sustainable and not detrimental to the environment. Each year the Michelin Group produces more than 178 million tires in 68 production facilities in 17 countries, and it operates sales networks in more than 170 countries. The product offerings are many: from bicycle, passenger car, truck, motorcycle, and tractor tires, to tires for 5-ton earth- moving machines. Michelin employs 111,700 people worldwide and owns one of the oldest, most famous trademarks in the world – the legendary Michelin Man. In the development of new products, Michelin faithfully pursues the concept of "MICHELIN Total Performance", backed by the rigorous standard of always bringing together a number of performance characteristics into a tire, to achieve optimal results. We follow this philosophy not only in the development of our standard products, but also in motorsports. Numerous technical innovations help to relieve burdens on the environment, drivers, and businesses. Hidden out of sight in tire casings, tread designs, and rubber compounds, throughout their lives MICHELIN tires show their full potential: they offer excellent grip, long life, and reduced fuel consumption thanks to their low rolling resistance. To better understand the conditions which tires are subjected to in everyday use, in the summer of 2014 Michelin began a unique research project – the Road Usage Lab. Vehicles from 3,000 drivers in Europe were equipped with special measurement devices to record data about the tires' use. These valuable findings are being employed in the development of future tire models, making them better suited to the needs of real drivers. *List prices, if included, are a guide price used to determine the markup between tyre manufacturer and distributor. **Prices include VAT and delivery within Germany. Bitte beachten Sie den Preisaufschlag von 8.50 EURO pro Reifen, wenn wir auf eine Insel liefern müssen.